Who is to Blame for a Catastrophic Injury to a Child? Accidents can and will happen during childhood. But when accidents result in catastrophic injury, it can be devastating and life-changing. Things become even more tragic when the incident could have been prevented if it wasn’t for someone else’s negligence or carelessness. If your child was seriously injured or has died in an accident that was caused by a negligent party, an experienced personal injury lawyer can help you seek justice. When you need legal representation for a child injury claim, turn to Chambers & Noronha. Our Santa Ana attorneys help injury victims throughout Orange County and Southern California, advocating vigorously for their legal rights. 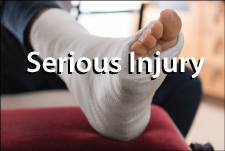 We have extensive experience with a range of accident claims, including those pertaining to premises liability, products liability, car accidents and wrongful death. We can fight for the financial compensation you deserve for medical bills, future treatment, pain and suffering, and other damages. Traffic accidents — Injuries can occur when a child is riding in a vehicle involved in a collision. Pedestrian accidents — Children can be injured while walking or playing outside of schools, day care facilities, parks, residential areas and other locations. Accidents at school or day care — A child might be injured while under supervision of school or day care employees. Falls — Children can fall and get injured in many places, including playgrounds, parks or in hazardous areas. Drowning or near-drowning accidents — These incidents can occur at swimming pools, beaches and other supervised or unsupervised areas. Dog or animal attacks — If severe, these attacks can result in permanent scarring or disfigurement — and even death. We understand that this is an emotional time for your family, and we are dedicated to being your legal advocate from day one, handling all aspects of your case with diligence, effectiveness and compassion. Call us at 714-558-1400 or send an online message to discuss your case in a no-cost, no-obligation consultation.